Would it not make sense to build shared cycleways at the time the railway is being constructed? On several occasions whilst flicking through our local Adelaide newspaper, I’ve come across articles and comments about our apparent lack of cycleways around the city of Adelaide. Comments range from the usual classic ‘chestnuts’: lack of funding, short-sightedness, greedy politicians, lack of vision, the growing need for more car space, and so on. However, I’ve not come across one comment or article that asks the obvious question. Why don’t we build cycleways along active rail corridors? And even more so, why the hell don’t we build them at the same time we build new ones? Oh yes, we have many initiatives on building cycleways on inactive or former rail corridors, but it seems to stop there. 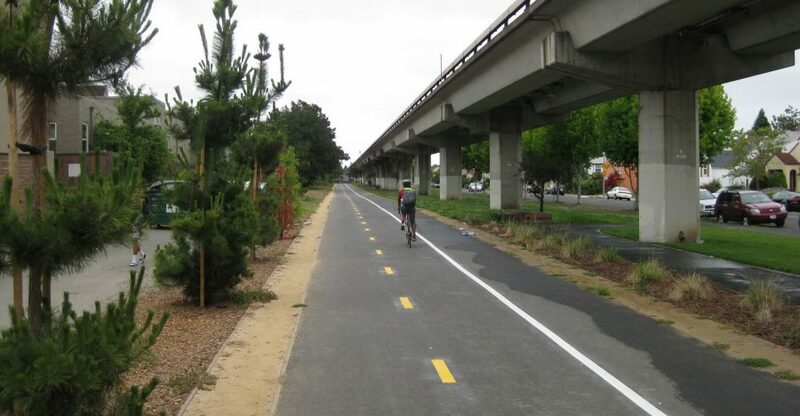 There are many ‘rails on trails’ initiatives in various spots around the world but none or very few of them mention integrating cycleways on active rail corridors. Adelaide is a prime example in which a far better and more useful cycle network could be developed by integrating complete and unbroken adjacent cycle paths along active corridors. ‘Unbroken’ in the sense of not having to deviate from the rail corridor at certain sections and having to zig-zag through the local street network. I’m sure there are many cities around the world that could benefit from integrating cycleways with active rail corridors. Just as an aside, a good cycleway is often constructed of a smooth asphalted path wide enough to accommodate cycle and pedestrian traffic. Often, a line in the middle of the cycleway separates the two. Most of us casual cycle riders are not wanting to trundle up steep hills. Frankly, many of us are simply not fit enough to do so. I’m certainly not. I used to ride to work but having been nearly knocked off three times by other cars, I decided to take a quieter route but this meant double the time taken and I soon stopped and reverted to using the car again. Cycleways need to be complete and not fragmented. I can’t stress this more. With proper infrastructure in place, there is less likelihood of trespassing; the majority of cases being pedestrians trying to take shortcuts to get from A to B over the rail corridor. Are railways nervous about integrating cycleways in case of injury to the public? The reality is often different. Advocates of integrating railways with cycleways often point out that trespassing incidents would be reduced if a proper cycleway was constructed in the first place. There are a paltry 1,400 miles of integrated paths and railways in the United States, but the real need for having complete integrated paths and cycleways can be justified in higher density cities where reducing exposure of automobile and heavy road traffic to cycle users would be highly beneficial in terms of health and safety. Maybe it’s about the increased spend of integrating cycleways in active rail corridors. Who’s going to pay for it? In most cases, it is the taxpayer that pays; however, many of us have felt the frustration that occurs when governmental bodies and public spending schemes are so badly coordinated that we end up paying far more than we should. How many of us have experienced roadworks in which the road is taken apart, a new service added and then put back together only to find out that shortly afterwards, the whole process is repeated for another service to be installed? Or even worse, when a whole road is shut off for months because of a new bridge or other piece of infrastructure is being installed and yet, not taking the perfect opportunity to improve the crater-pitted road (Majors Road in Adelaide. Grrr!!). It is the same for integrating cycleways and railways. Doing this after the railway is constructed is far more expensive and always requires extensive consultation with the community. Moreover, there are strict guidelines with pedestrian and cycle path design along existing active road and rail corridors which must be adhered to, at least here in Australia. I always admire when initiatives are put in place to integrate complete and unfragmented cycleways alongside active rail corridors, especially in metro areas. There are a number of excellent projects where former railway lines are converted; however, most of these routes cater for the weekend leisure cyclist and not for those who genuinely want to use their bicycles to get from A to B in their cities. Railway design is highly optimised in terms of grade, locality and route to transport as many people from A to B. Why can’t we have the same for cyclists? I personally believe the main holdup is simply due to lack of coordination and short-sightedness. Are there any cities that integrate railways and cycleways as a long-term plan? If so, I’d love to hear about them. We need more visionaries in this space. Here are a few examples of walkways and cycleways adjacent to active rail corridors.